The Poet’s club aims to identity and nurture the budding poets among the students who join St.Teresa’s College every year. Students are given ample opportunity to hone their skills as they get involved in various competitions and workshops conducted by the college as well outside. To initiate new students to the world of creativity. To encourage students to pen down their thoughts into words. To keep a record of their creations in manuscript form. To encourage members to compete as and when opportunities arise. 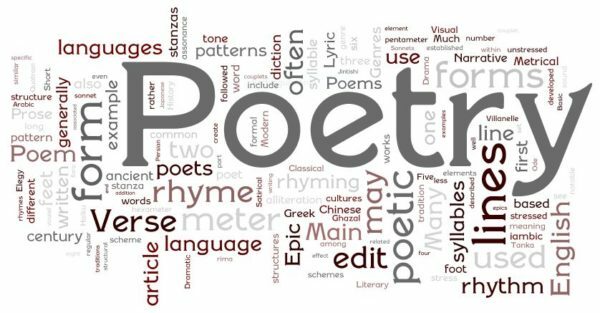 To hone the poetic skills of the members by offering a poetry workshop. Poetry Workshop 2017: In Association with the Ayyappa Panicker Foundation, a poetry workshop was held on 15th September 2017. Sri.Sebastian from the Ayyappa Panicker foundation engaged the morning session, which was followed by a poetry reading session by the students. Students from neighbouring colleges and schools took part in the workshop. Few students got selected to the State level Poetry Workshop: DAKSHINA-SOUTH INDIAN POETRY FESTIVAL held at Thiruvananthapuram on 19–21st September 2017. Parvathy Salil of IPG English Literature participated in the SOUTH INDIAN POETRY FESTIVAL: DAKSHINA– held at Thiruvananthapuram on 19-21st September 2017.